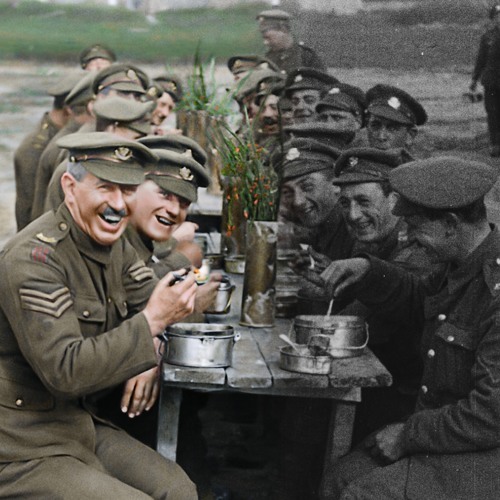 Commemorating the centenary of the First World War, Peter Jackson was approached by 14-18 NOW and the Imperial War Museum to make use of their extensive archive of wartime footage. He responded to the call by performing significant alterations to it, including colourisation and conversion to 3D, hoping to present it afresh and help modern audiences feel closer to the war it documents. It's been a controversial project, surrounded by much commentary on its ethics, but after all the hype and chin-stroking, They Shall Not Grow Old - even the title of which has been edited to suit modern syntax - is finally here. Those ethical questions occupy a good deal of our attention, justifiably so, but we find there's a good deal more to consider about the film too. Perhaps unusually for a First World War film, it eschews entirely any discussion of the political background to the war or criticism - even mention - of the top brass, instead focusing entirely on the experience, in quite general terms, of the British soldiers. Narrated entirely by some 114 different servicemen, their commentary drawn from BBC and IWM interviews, Jackson builds a portrait of a mindset of the salt-of-the-earth Tommy, keen to go to war at a tender age, open to new experience, happy to do as he's told and get on with his job under terrible, and terrifying, circumstances. It's a portrait that leaves out at least as much as it includes, and the question of how choices were made as to what footage and audio was included from the archives made available to Jackson is arguably more pressing, and certainly less clear, than that of why the footage was altered in the ways it was. We grapple with all sort of these issues and touch on several more, particularly the traditional, unfair, untruthful, and insidious permission the film gives English audiences to believe we won the war without help - an issue that angers José, a Canadian, and rightly so. Mike also picks up on a couple of moments that struck him as of particular relevance in the age of Brexit, though that's also because it's a topic he can be relied upon to bring up at a moment's notice. As to those pesky ethics, we come away, despite some fair criticisms, a little milquetoast on the subject. Mike has a bigger issue with the quality of the alterations than the justification, finding them genuinely unpleasant to look at for the most part, but suggests that the modifications have been so extensive that the footage has been transformed into something qualitatively different, that to take the film seriously as a document would be an act of madness. José, rather more simply, sees value in the work, pointing out how it allows us to pick out aspects of scenes, and particularly faces, more easily, and allowing a more visceral closeness to the environments depicted than we might otherwise have. All in all, as long as the original black and white film remains extant and publicly available, and provided that, when used as teaching material, the conceptualisation and production of They Shall Not Grow Old is included as a matter for classroom discussion, we're not convinced that the film is a bad idea. Below are links to a few blog entries and reviews we mentioned in the podcast, from Lawrence Napper and Pamela Hutchinson. Lawrence Napper's first blog entry: https://atthepictures.photo.blog/2018/10/05/they-shall-not-grow-old/ Lawrence's second blog entry: https://atthepictures.photo.blog/2018/10/12/they-shall-not-grow-old-2-the-abject-archive-the-sacred-archive/ Lawrence's review on Iamhist: http://iamhist.net/2018/10/they_shall_not_grow_old/ Pamela Hutchinson's review on Silent London: https://silentlondon.co.uk/2018/10/16/lff-review-they-shall-not-grow-old-honours-veterans-but-not-the-archive/ Recorded on 30th October 2018.